A commercial tree service can take care of your trees and shrubs to make sure that they stay healthy and beautiful year round! Fall is the season to enjoy your trees – the gorgeous colors of their leaves, the elegance of their reaching branches, and the strength of their trunks. But everyone knows that fall is also the season for raking leaves and fallen branches. What are you to do when your trees start to take over your yard? Call a professional, commercial tree service! A commercial tree service can take care of your trees and shrubs to make sure that they stay healthy and beautiful year round! During the spring and summer, a commercial tree service will make sure that your trees are receiving the proper amount of water and nutrients to continue their growth, and will make sure that unruly branches are trimmed back to prevent damage to the tree and to your home or business. 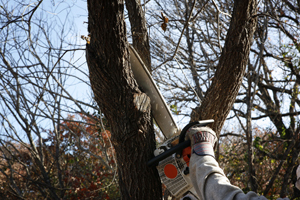 What’s the Advantage of a Commercial Tree Service? There are many advantages to having a commercial tree service take care of your landscaping needs. Eco-Friendly Service – Trees are incredibly important to our health and the health of the planet. Trees catch and use rainwater, which helps prevent flooding. Trees also supply us with the majority of the oxygen we need to survive. By hiring a commercial tree service, you are helping to nurture healthy trees that can help keep the world green, safe, and healthy. Save Money – Tree can help you save on energy costs. Trees planted in the right spots on your property will block the sun in the summer and letting light in during the winter, helping to regulate the temperature of your home or business. Healthy, well placed trees have been shown to save business owners up to 56% on energy costs during sunny summers. Increased Resale Value – Home buyers like trees! Well-placed trees can add to the resale value of your home or business. But the trees need to be healthy looking and well-cared for in order to attract buyers. Consult with a commercial tree service to find out the best places to plant trees for energy savings as well as home safety. Interested in hiring a commercial tree service? This entry was posted on Monday, October 12th, 2015	at 4:28 pm	and is filed under Blog	. You can follow any responses to this entry through the RSS 2.0	feed. Both comments and pings are currently closed.